Yeah, it's 9:12 a.m. (well, as I write this ... not when I post it ... long story, but I think you can guess why I'm posting so much later as I'm not going to spell it out here) and what I really want, more than anything in the world, right now - at this very moment - is a root beer float. I'm sure I'd regret it, sure I'd feel sick and throw up straight afterwards, but I feel like my body needs it right now. A root beer float, for those of you who are British, is two or more scoops of (usually) vanilla ice-cream dropped into a giant glass mug and topped up with copious amounts of root beer (or Pepsi, as I used to also have as a child). I have great memories of passing the summer nights (before my brother was born - you know, I love you, Justin, but I had the only child treatment once upon a time and it was ... awesome. In fact, I still act like an only child ...) with my dad in front of my parents' TV upstairs, watching 60 Minutes (yeah, I was five and I was watching 60 Minutes with what's-his-face-famous-newscaster because it was the show my dad watched) and watching with delight as my dad made me a root beer float in an old-fashioned root beer float glass during a commercial break. He used to make me eat it at the dinner table because the glass was as big as my head and he always put a straw AND a spoon in, which I loved. It seemed like a decadent treat to have at home. 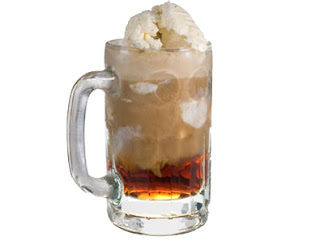 What makes me sad is not the lack of root beer floats in the UK (of course, you can always make your own ... but where are you gonna find root beer? And root beer as in Barq's or A&W, not root beer as in that medicinal tasting concoction some person merely thought resembled American root beer) but the look of shock/horror/disgust on John's British peoples' faces when I describe a root beer float to them. It makes me sad that some peoples' palates are too "refined" to enjoy delights such as root beer floats, cheese fries, corn dogs or fries dipped in milkshakes (hey, don't knock it 'till you've tried it). Great, now I want fried chicken tenders along with a root beer float for my breakfast. Gross. Burp. dude. we had the same childhood. except i drank cream soda instead of root beer. and i watched 60 minutes with what's-his-name with my dad. tick-tock-tick-tock. 60 minutes. I TOLD you we had the same exact childhood. I bet you have an invisible Justin somewhere. Ask your mom about him. Hey. At least you have ACCESS to this food. I can only dream of it. My dad was a big fan of making ice cream floats too (with whatever soda we had on hand). Funny that it's our FATHERS who taught us to indulge in these simple delights. My mom liked floats, but she was never the one to suggest the idea. She just shared in consuming ours after we had made them.